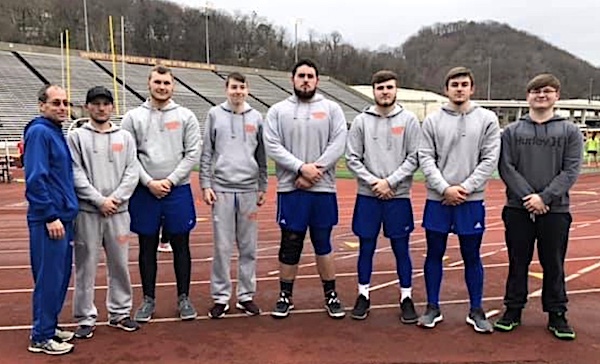 Charleston, W. Va. — The Tolsia High School Track Team is putting up some impressive numbers this season and that was evident in the Roane County LKC Challenge and the Sherman Tide Invitational recently. L to R Head Coach Noah Copley, Austin Gauze, Cameron Chaffin, Will Clayton, Brent Setser, Devon Crum, Pat Finley, James Watts. Senior Brent Setser who has signed on to play football at West Virginia State University was outstanding in the shot-put event placing 7th out of 47 competitors. In the Sherman Tide Invitational Junior Captain Austin Gauze and Seniors Devon Crum, Pat Finley and Cameron Chaffin finished 6th in the 4 x 100 race beating Poca, Buffalo, Ravenswood, Pikeview, Sissonville, Cross Lanes Christian and Independence. They also had a strong performance in the LKC Challenge with a Runner Up finish. Crum also finished fifth in the long jump with a jump of 18 feet.